Serenissimvs Et Potentissimvs Princeps Ac Dominvs Dn. Maximilianvs, D. G Comes Palatinvs Ad Rhenvm, Vtrivsq[ve] Boiariæ Dvx S. R. Imp. 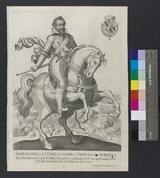 Archidapifer, Et Princeps Elector / Christoff Greutter in Augspurg f. et inpr.